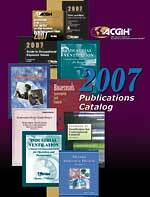 ACGIH's 2007 Publications Catalog provides up-to-date publication listings with photos of each publication cover. All information is divided into 14 topic areas and is also available in a PDF format. The catalog includes information on upcoming educational events, the benefits of membership, and more.